It was bound to happen - a pedalboard capable of being programmed from a iPad. 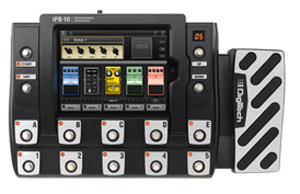 DigiTech has announced the introduction of the iPB-10 Programmable Pedalboard, the world’s first programmable pedalboard using the Apple® iPad®. By harnessing the power of the iPad, the iPB-10 combines the simplicity of a pedalboard with the flexibility of a multi-effect system. “With the ultra-secure iPad mounting system and the no-latency, high-def processing, we have brought the power and infrastructure of the iPad to bear in live performance situations.” said Urry. “You can count on seeing a long line of enhancements and features available in future upgrades via the Apple App Store.” Urry added.